It seems like whichever is your favorite media company or industry analyst, everyone is talking about Data Catalogs. Gartner now says that Data Catalogs are on the declining slope of their Hype Cycle, a sure sign that this is no longer a fad technology and has hit commercial critical mass to justify an actual product category, even if this does not extend in their case to a Magic Quadrant. There are now sufficient data catalogs in daily use at both large and small organizations to underscore the value for a variety of use cases including analytics, big data projects, data management and business intelligence initiatives. 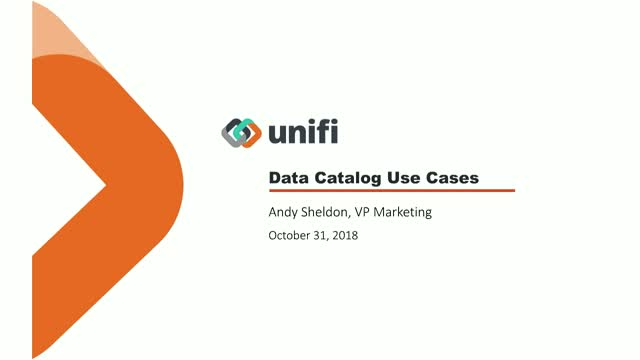 In this webinar, Andy Sheldon, VP of Marketing at Unifi, will describe some of the use cases and value proposition for a number of the Unifi Data Catalog customers. He will also describe some of the early “Ah Ha” moments when customers implement and start using the Data Catalog. Remember the early days of cellular telephones, when a call routinely started with a few minutes of “Can you hear me now?” Each of those minutes cost the caller without contributing to the desired communication. Today we have a similar situation with analytics when meetings routinely begin with “Where did you get this data?” The time taken when several people—generally high-level and high-salary people—spend several minutes questioning data trustworthiness has a very real cost and contributes little to knowledge, understanding, insight, or decision making. Trusted data is a critical element of analytic culture and data-driven business. Companies today consider data a key asset that influences every aspect of business from strategy to operations. Lack of trust in the data inhibits decision making, slows progress, and seeds confusion and miscommunication at all levels. Repeatedly and redundantly establishing trust with each data use case is inefficient and costly. This webcast illustrates the high cost of untrusted data and the cost savings possible when trust becomes a data management priority. There are now sufficient data catalogs in daily use at both large and small organizations to underscore the value for a variety of use cases including analytics, big data projects, data management and business intelligence initiatives. In this webinar, Andy Sheldon, VP of Marketing at Unifi, will describe some of the use cases and value proposition for a number of the Unifi Data Catalog customers. He will also describe some of the early “Ah Ha” moments when customers implement and start using the Data Catalog. Jim Barksdale, former CEO at Netscape, once said “If we have data let’s look at data. If all we have is opinions, let’s go with mine.” The message is clear, but having data is only the beginning, Your analysts need to find the right data, understand the data, and deliver timely insights at a reasonable cost. That’s where data catalogs make a real difference. The value and benefits of a data catalog are often described as the ability for analysts to find the data that they need quickly and efficiently. Data cataloging accelerates analysis by minimizing the time and effort that analysts spend finding and preparing data. Anecdotally it is said that 80% of self-service analysis without a data catalog is spent getting the data ready for analysis. With a catalog, the numbers are reversed – 80% analysis with only 20% data preparation. Although there is much truth in the 80/20 story, anecdotal evidence is often not enough to gain funding and support for a data catalog. To craft a compelling business case we need to quantify the value of a data catalog. The Unifi Data Catalog allows you to catalog everything--no matter where data lives. Before you can take advantage of all the actionable insights your data assets can offer, you must consolidate these critical informational sources into a single metadata repository. Your data catalog provides you and your users with a simple, searchable and uniﬁed resource that enables data discovery, no matter the sources’ original location. Most organizations have valuable data they could use to gain new business insights that directly lead to action and better decisions. The challenge is in accessing the data and providing self-service data tools that allow citizen data users to answer their own questions, explore their hunches and move quickly into effective actions that positively impact the business. Join us to hear Jason Cunningham, Chief Medical Officer at West County Health Clinics, as he describes his journey from being a doctor-without-data to providing his clinic with analytics and insights that fundamentally changed how they treat patients.